“Am I in the right place?” thought more than one volunteer as the Penn Serves LA volunteers approach the home on 119th street in South Central Los Angeles at a Penn Serves LA summer event on late Sunday afternoon. Children were outside playing; the street was lined with modest but well-kept houses. 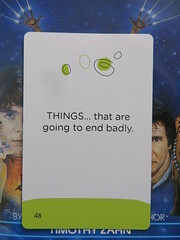 The answer was affirmative. That day, our group of seventeen Penn alumni and family members were arriving to serve One on One Outreach, a 501(c)3 nonprofit started in the heart of South Central by one of its own residents, Ashly Plourde– at his local residence. Each month, Mr. Plourde freely offers his driveway for the food assembling and delivery service for low-income families he started back in 1998. Noticing that several of his fellow South Central neighbors were finding it hard to afford food, Mr. Plourde, now 63, started offering ground beef and rice he purchased to his neighbors at no charge. When he saw how quickly everyone appreciated the good deed, he decided to expand the effort on a more regular basis. He would find the cheapest deals on food he could afford, stock up and give it away at various community locations. Today, the grassroots effort has grown into a regular monthly door-to-door outreach offering a large box of groceries per household, still entirely free, to the low-income, food insecure neighbors that live within just a few blocks of the assembly point. Over 16 percent of Americans, or nearly 17 million people, suffer from food insecurity – a statistic which has been tracked by the U.S. Department of Agriculture since 1995. Food insecurity, which is defined in ranges from very low to high by the USDA, occurs when citizens lack access to food, either due to limited food availability in their neighborhood stores, or lack of money to purchase available food. The problem can cause disrupted eating patterns and reduced food intake – many skip meals or do not eat for several days. Today, more than 47.8 million Americans – or 1 in 7 Americans — receive food stamps through participation in the Supplemental Nutrition Assistance Program. Due to poor economic conditions, rising poverty rates, and expanded qualifications, participation has increased 70% since 2007. The average monthly food stamp benefit per person in California is $149.05. However, according to the USDA Food Plan, which is tracked monthly, it costs over $235 a month to feed an adult male on a “low-cost” plan. The differential is the gap that One on One hopes to fill for the local families. In fact, the group chooses its delivery dates toward the end of the month, as food stamps are delivered on the first of the month are often depleted by month’s end, leaving many struggling. Our youngest volunteers, children of local Penn alumni, fill the boxes in the act of serving others as well. 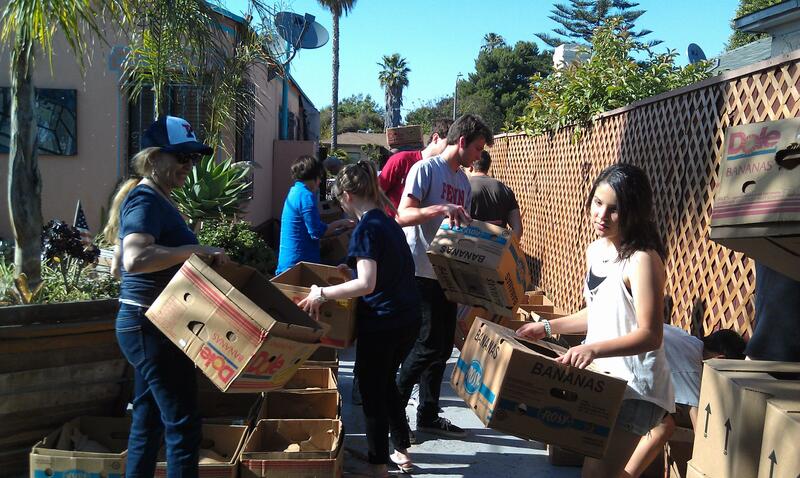 Our group works to fill 168 large boxes with purchased and donated supplies. The finished product resembles what one might carry out from their local Vons (a supermarket here in southern California) trip –and includes bran flakes, granola bars, toilet paper, potatoes, onions, potatoes, bleach, AJAX, bologna, eggs among other items. These groceries would cost a minimum of $50 if purchased separately. The group packs two pickup trucks five boxes high. With many hands, we finish phase one within an hour. Before we start our delivery walk, one woman and her son sheepishly walk toward the truck to request her box. Ashly recognizes the woman as a regular. First needy family served. Next, Ashly and fellow board member Michael Schwartz speak about One to One’s mission and its accomplishments. It is clear from their words this work comes from a special place in each volunteers’ heart (in fact, the group is 100% volunteer run). Mr. Plourde explains why he started this effort, and it becomes obvious this man possesses deep compassion of the suffering of others. Mr. Schwartz, who has been involved more than 13 years, talked about how the group is structured and seeks its funding. Currently, One to One relies generous donations from 99 Cents Store and individual donations to provide the boxes and its contents. One-to-One Board Member Michael Schwartz speaks about mission and structure of One on One Outreach. Ashly Plourde, the group’s founder and President, is on the right sitting on the filled truck. To deliver, Ashly and Michael slowly drive the two packed pickup trucks down the street to the houses just a few blocks away. The sweet suburban-like street where we assembled the boxes quickly turns into a stretch of dilapidated apartment buildings with between 4 to 20 units on a busy urban street. The experienced volunteers know the buildings well – from the folks in each unit to who owns each building– and their guidance is invaluable. We are instructed to make sure we follow one another closely to ascertain as many families as possible receive a box. No apartment should be skipped; however if they aren’t home, we are instructed to move onto the next home as each box needs to be handed to a resident. The buildings are pre-determined and some apartments that contain more than eight residents in the apartment might regularly receive a second box. Each house holds a story but there’s no time to learn them – our mission is to deliver quickly and not meander. We get a quick peak inside apartment after apartment – some filled with obvious despair. One grateful recipient walked to the top of her stairs, and exchanges a glance with Ashly. Ashly shot back a quick wave full of deep understanding and mutual respect. No spoken word was needed for the interchange – they understood the significance of the need this group is filling – that most basic need of all, food. That’s how it played out at many deliveries – a nod of thanks here, a gesture here, and a simple thank you. It was a kind gesture any neighbor might offer another, but it happens here in Los Angeles. “I just love that man and what he does,” shares one lady who just received her monthly box. Most every door and window we approach was gated and barred, our reminder of the tough neighborhood we are serving. Most folks seemed suspect of who was pounding on their doors, peeking through pulled curtains. 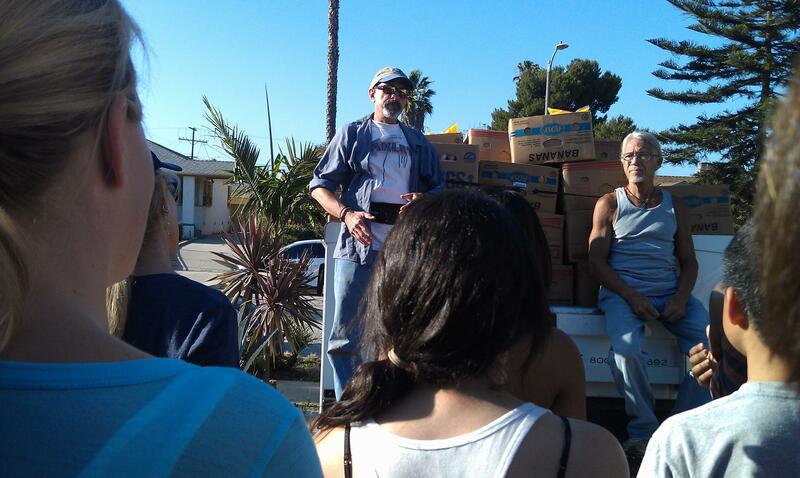 Some hear us call out “One on One Outreach”, the doors opened freely and quickly. The need the group is filling clearly exists, as demonstrated by the dozens of people approaching the truck asking for a box. “We truly appreciate the Penn Serves volunteers lending their help today and hope to see many return in the future, ” shares Michael. With such an impactful opportunity of direct service that likelihood seems quite high that our Penn alums will be back to lend our manpower to those in need in South Central Los Angeles. If you are interested in learning more about helping with One on One, please contact Michael at drzini@verizon.net. 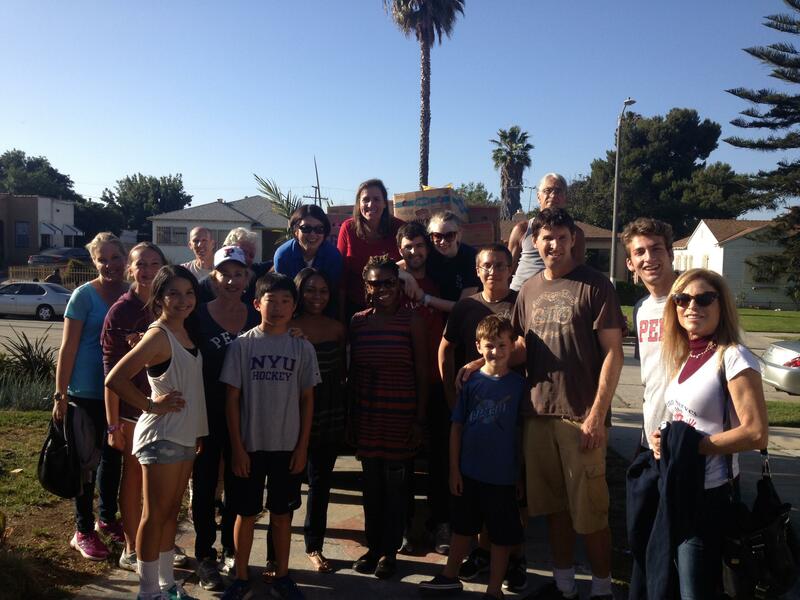 If you are interested in more Penn Serves LA events or to get involved, please contact us at pennservesla@gmail.com. Penn Serves LA is excited to announce our final three events for 2013! Mark your calendars and contact us at pennservesla@gmail.com for more information or just be on our mailing list for future events. We look forward to serving with you, Quaker style. August 24th, 10 a.m. to 1 p.m. — HELP RESTORE A PARK – Restoration Day at Ken M. Harbor Regional Park, Lake Mocado (Harbor City) – Join us for environmental cleanup and nature exploration. Learn about the local habitat, wildlife, conservation and environmental challenges impacting our community from a leading Southern California bird expert and past President of the Southern California Audubon Society. Alumni children welcome with their parents. Click here to register. September 28th, 10 a.m. to 2 p.m. — IMPROVE A CHARTER SCHOOL – L.A. Leadership Academy (Lincoln Heights)– Make a difference at this Lincoln Height’s charter K-12 school. This high school serves over 95% students qualifying for free and reduced lunch and is dedicated to teaching leadership. Roll up your sleeves and paint classrooms alongside these students. Alumni children over 10 are invited to join with parents. Light lunch will be provided. Click here to register. November 17th, 10 a.m. to 1 p.m. — SHOW APPRECIATION TO THE TROOPS — American Red Cross (Santa Monica)— Join us to learn more about the impact of American Red Cross and write letters to our heroes to extend our appreciation to the Armed forces during the holiday season. Every holiday season, the Red Cross sends a “touch of home” to American men and women serving our country. All ages welcome. Click here to register. About Penn Serves LA – Started in 2012, Penn Serves offers a way for direct community service for local Penn alumni and their children to serve Los Angeles’ most needy populations. We partner with established nonprofits and grassroots organizations for one-time volunteer opportunities. So far, we’ve served meals to the homeless, delivered food to low income families, planned activities with immigrant children, and so much more.